If breathtaking views are the best muse then someone just landed the perfect pad. 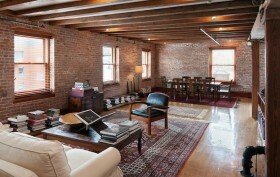 Noted photojournalist James Nachtwey has just sold his beautiful loft at 265 Water Street for $1.8 million dollars. Now the new owner can sit at her breakfast table and gaze placidly at the Brooklyn Bridge. Sounds like heaven, right? The 1,650 square-foot loft, resting atop a historic 19th century landmark building, is situated on one of New York’s charming cobblestone streets in the Financial District. This full floor penthouse suite is the perfect artist’s hideaway, with Artisan woodwork throughout, a wood beamed ceiling and a private studio — or second bedroom if she prefers.